Cossack-Polish War (1648–57). The conflict began in 1648 as a typical Cossack uprising but quickly turned into a war of the Ukrainian populace, particularly the Cossacks and peasants, against the Polish Commonwealth. Hetman Bohdan Khmelnytsky assumed leadership of the Ukrainian forces. The war can be divided into six phases. January–November 1648. In this period a series of brilliant Cossack victories aroused the whole Ukrainian people and won wide support for Bohdan Khmelnytsky. What was strictly a Cossack rebellion became transformed into a mass movement against the Polish nobility. On 21 January 1648 Khmelnytsky led a small unit of registered Cossacks and Zaporozhian Cossacks in an attack on the Polish garrison on Bazavluk Lake (on the Dnipro River) and overpowered it. This freed the Zaporozhian Sich from Polish control and won the Zaporozhian Cossacks over to Khmelnytsky's side. He was elected hetman. The subsequent months were spent in preparations for a larger rebellion. Proclamations were sent out urging the Cossacks, peasants, and burghers to rise against the nobility. Khmelnytsky concluded an important treaty with Turkey and the Crimean khan Islam-Girei III, obtaining the aid of a 40,000-strong Tatar army under Tuhai-Bei's leadership. The Polish government sent an army of 30,000 men in April 1648 to suppress the uprising in Ukraine. The Polish commanders expected little opposition and made a serious tactical blunder by dividing their forces. About 10,000 rebels surrounded the Polish advance guard of 6,000 men, led by S. Potocki, Hetman Mikołaj Potocki's son, at Zhovti Vody and destroyed it on 16 May 1648 (see Battle of Zhovti Vody). Khmelnytsky and the Tatar army met the main Polish force, commanded by the grand hetman Mikołaj Potocki and the field hetman Marcin Kalinowski, near Korsun and routed it on 26 May 1648 (see Battle of Korsun). The two Polish commanders were captured by the Tatars. After these victories fighting between Cossack-peasant detachments and Polish troops flared up throughout Ukraine. In the summer of 1648 the detachment of Colonel Maksym Kryvonis engaged in several bloody battles with the Polish nobility's force, led by Prince Jeremi Wiśniowiecki. During this fighting the population suffered terrible losses. The Polish troops systematically killed all Cossacks and peasants, including women, children, and the old people who fell into their hands, while the rebels treated the nobles, Catholic clergy, and Jews, many of whom took the side of the Polish nobles, in a similar fashion. At the end of the summer the Polish government sent another well-equipped army of 32,000 Poles and 8,000 German mercenaries against the Cossacks. The army's command, consisting of A. Koniecpolski, M. Ostroróg, and Prince Władysław-Dominik Zasławski, was weak and inexperienced. Jeremi Wiśniowiecki, who wanted to be the commander in chief of the Polish forces, did not have adequate communications with the advancing Polish army. Confident of victory, the Polish commanders let Bohdan Khmelnytsky assume a very convenient position near Pyliavtsi. During the battle that took place there on 23 September 1648 (see Battle of Pyliavtsi), the rebels, numbering about 80,000, completely crushed the Polish army. Khmelnytsky's army of about 100,000 men marched into Western Ukraine and in early November besieged Lviv. Several Cossack detachments advanced west into territories settled mostly by Poles or Belarusians, and anti-noble and anti-Polish revolts also broke out there. At the request of the Ukrainian burghers Khmelnytsky lifted the siege of Lviv and besieged Zamość, where the remnants of Wiśniowiecki's army had sought refuge. With the election in November of a new Polish king—Jan II Casimir Vasa, whose candidacy was supported by Khmelnytsky—the Ukrainian army returned to the Dnipro region and on 2 January 1649 triumphantly entered Kyiv. April–August 1649. Bohdan Khmelnytsky decided to separate completely Ukraine from Poland, but although he continued to triumph on the battlefield, he could not overpower the enemy. Mobilizing all the forces of the Polish Commonwealth, Jan II Casimir Vasa began the offensive against Khmelnytsky in April 1649. The main Polish force under the command of the king himself departed from Volhynia, while the Lithuanian army, commanded by the Lithuanian hetman, Prince J. Radziwiłł, marched on Kyiv. On 10 July Khmelnytsky and Islam-Girei III surrounded a part of the king's forces in Zbarazh. When Jan II Casimir Vasa with his army of 25,000 men went to the aid of the besieged troops, Khmelnytsky led a surprise attack on 15 August and encircled the king at Zboriv (see Battle of Zboriv). In the meantime, during June and July, the Lithuanian army almost reached Kyiv, but the Cossack-peasant raids in the rear forced the Lithuanians to retreat. A decisive and final victory over the Poles appeared to be within Khmelnytsky's grasp. But at this critical moment Islam-Girei III, who was bribed by the Poles and disturbed by the rapid growth of the Ukrainian forces, withdrew his troops, which forced Khmelnytsky to negotiate with the Poles. On 28 August 1649 Khmelnytsky concluded the Treaty of Zboriv with the Polish delegation headed by Jerzy Ossoliński. The treaty did not really satisfy either side. August 1650–September 1651. International factors began to play a more important role in the Ukrainian-Polish conflict. The Cossacks experienced their first defeats and were forced to retreat from the positions they had won previously. In the summer of 1650 both sides tried to isolate each other by diplomatic means. Polish diplomats warned Moscow about the Cossack threat and succeeded in gaining the support of Vasile Lupu, the hospodar of Moldavia. Bohdan Khmelnytsky strengthened his ties with the Crimean Tatars and the Ottoman Porte. To undermine Polish influence in Moldavia, Khmelnytsky sent a large Cossack-Tatar army there in August 1650 and forced Vasile Lupu to sign a treaty and to promise to give his daughter Roksana Lupu in marriage to Khmelnytsky's son Tymish Khmelnytsky. 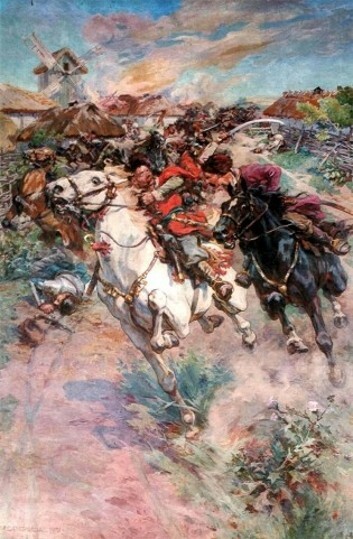 While the Cossacks were busy in Moldavia, a Polish army of 50,000 men attacked the Bratslav region on 20 February 1651. A major battle took place in June near the town of Berestechko in Volhynia (see Battle of Berestechko). The Polish army, which included about 20,000 German mercenaries who were veterans of the Thirty Years' War, faced the Ukrainian-Tatar forces. The Cossacks were betrayed once again by the Tatars and were defeated. 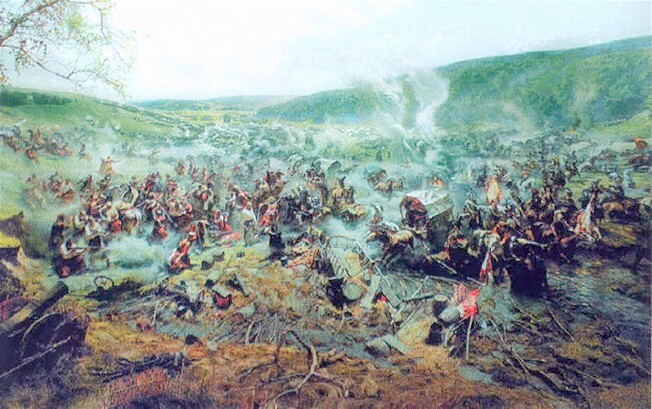 On 10 July they retreated under difficult conditions to Bila Tserkva. At the beginning of August the Lithuanian army occupied and ravaged Kyiv. In spite of these setbacks Bohdan Khmelnytsky mobilized a force of 50,000 men and on 24–25 September 1651 engaged the enemy in battle near Bila Tserkva. The fighting was fierce but inconclusive. Drained of strength, both sides began negotiations, which led to a treaty unfavorable to Khmelnytsky—the Treaty of Bila Tserkva—on 28 September. Soon after the signing of the treaty Polish troops and nobles began to return to Ukraine and to restore the former order. Part of the population of Right-Bank Ukraine, threatened by the return of their former oppressors, began to abandon its villages and migrated east to Left-Bank Ukraine and Slobidska Ukraine. Spring 1652–winter 1653. Although the Cossacks scored several victories against the Poles, signs of fatigue and discouragement appeared, and Bohdan Khmelnytsky began to rely increasingly on foreign help. In 1651–2 he strengthened his ties with the Tatars and the Porte. He focused his attention on Moldavia, hoping that Tymish Khmelnytsky's marriage with Roksana Lupu would solidify the alliance of Ukraine with Moldavia and indirectly with Turkey and the Crimean Khanate. In the spring of 1652 Khmelnytsky sent Tymish with a large Cossack-Tatar army to Moldavia. On 2 June the army encountered a Polish force of 30,000 men at Batih (see Battle of Batih), and Khmelnytsky, who came to his son's aid, scored a brilliant victory. In August 1652 Tymish married Roksana, but in the spring of 1653 the Moldavian boyars, supported by Wallachia and Transylvania, revolted against Vasile Lupu and the Cossacks, and Tymish died defending Suceava (see Battle of Suceava). His death on 15 September 1653 put an end to Khmelnytsky's Moldavian orientation. In the meantime war again broke out in Ukraine. A large Polish army of 80,000 men invaded Podilia and was encircled at Zhvanets by the combined forces of the Cossacks and Tatars at the beginning of December 1653. At a critical moment the Tatars once again concluded an agreement with the Poles, forcing Bohdan Khmelnytsky to make peace with the Poles on 5 December on the basis of the conditions of the Treaty of Zboriv of 1649. This latest act of Tatar treachery convinced Khmelnytsky to change his foreign policy. Bohdan Khmelnytsky had maintained diplomatic relations with Muscovy almost from the beginning of the rebellion, but Tsar Aleksei Mikhailovich refused to support the uprising, for this would lead to war with Poland. The Polish defeats and the danger of Khmelnytsky's acceptance of the Porte's suzerainty, however, persuaded Moscow to resume negotiations with the hetman in 1653. These negotiations culminated in the Pereiaslav Treaty of 1654, according to which Ukraine recognized the protectorate of the Russian tsar while maintaining its complete autonomy and received Russian military and political aid against Poland. Summer 1654–autumn 1655. In this period the united Ukrainian and Muscovite forces took the offensive against Poland and scored significant victories. Major battles took place in Right-Bank Ukraine, Belarus, and Western Ukraine. In the summer of 1654 the Muscovite army and 20,000 Cossacks, led by Ivan Zolotarenko, invaded Belarus and captured Smolensk. Continuing the campaign in 1655, they took Vilnius in July. During the Belarusian campaigns a tension arose between the allies over the question of which side should control the captured territories—the Zaporozhian Host or Moscow. In the meantime the Poles invaded the Bratslav region in the fall of 1654 and on 20 January 1655 laid siege to Uman. Bohdan Khmelnytsky and the Russian commander, Vasilii Sheremetev, led a joint army of 70,000 men against the enemy and fought a hard but inconclusive battle near Okhmativ on 29 January 1655 (see Battle of Okhmativ). In the spring the Ukrainian-Muscovite forces invaded Western Ukraine, and by the end of September they besieged Lviv. In October, however, when Poland's new allies, the Tatars, arrived with reinforcements, the Cossacks and Russians retreated east. Autumn 1656–summer 1657. Bohdan Khmelnytsky became increasingly disappointed with the Russians, and he began to look for other allies against Poland. In the summer of 1655 the Swedish king, Charles X Gustav, took advantage of Poland's war with the Cossacks and Russians to seize the northern part of Poland and Lithuania. Moscow became perturbed at the growth of Swedish power. Hence, on 24 October 1656 it signed the Vilnius Peace Treaty with Poland and then jointly with Poland declared war on Sweden. The Ukrainian government, whose representatives were excluded from the negotiations, was very indignant over the peace treaty. Hence, in October 1656, in spite of Russian protests, Bohdan Khmelnytsky entered into a broad coalition with Sweden, Transylvania, Brandenburg, Moldavia, and Wallachia. The coalition had as its purpose the partition of Poland. In joining the coalition, the hetman was interested mainly in capturing the Western Ukrainian territories and uniting them with Ukraine. The interests of the coalition members diverged, however. Furthermore, Poland obtained diplomatic and military support from Austria, Muscovy, and the Crimea. In spite of this a Ukrainian-Transylvanian army of 30,000 Hungarians and 20,000 Cossacks under the command of Prince György II Rákóczi and Colonel Antin Zhdanovych invaded Poland in January 1657 and occupied Galicia and a large part of Poland, including Cracow and Warsaw. But the oppression of the local population by the Hungarians and the intrigues hatched by Muscovite agents among the Cossacks diminished the army's fighting capacity. Rákóczi was forced to retreat eastward before the Polish offensive. Towards the end of July 1657 he was encircled by the Poles and Tatars at Medzhybizh and was forced to sign the Treaty of Chornyi Ostriv on 22 July. Zhdanovych tried to hold the anti-Polish front but did not succeed. This catastrophe hastened the death of Khmelnytsky, which occurred on 6 August 1657. This marked the end of the Cossack-Polish War.